The camp is for children who are interested in Go and designed for all levels. 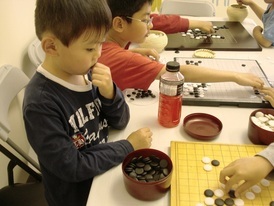 Beginner children will learn the basics of Go, while students who know Go will be able to further develop their skills in opening, tetsuji and closing. 1:30 pm to 4:00 pm Go activities and play against each other. Old students have $20 discount.